As a filmmaker I’m used to working with tight deadlines, shifting goalposts and hairy logistics. 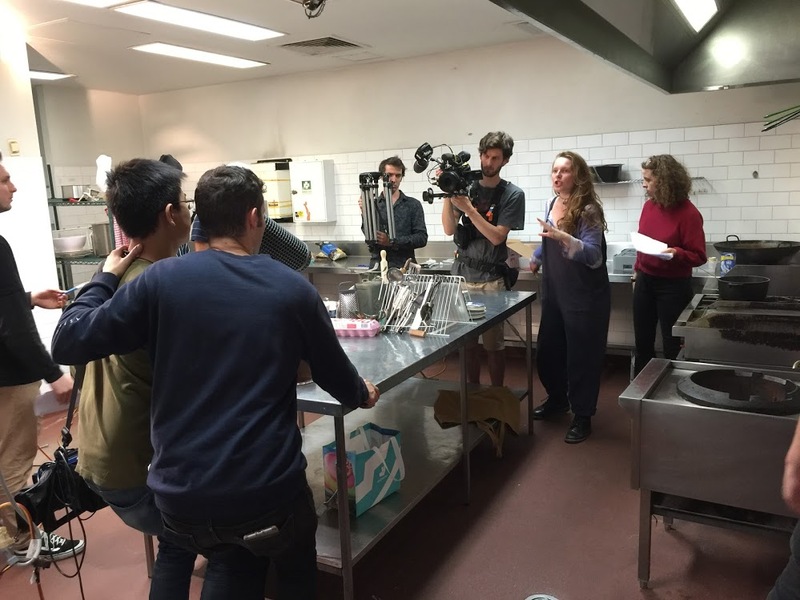 As a lecturer in Film and Television at the Victorian College of the Arts I’m used to corralling student filmmakers as they get their foot onto the first rungs of what’s often referred to, rightly, as a difficult industry. Last year, when I proposed the idea of Faculty of Fine Arts and Music students collaborating on a Web Series, I imagined the most difficult obstacle would actually be the alignment of cross-disciplinary schedules and curriculum. But the staff involved were very eager and moved mountains to make their curriculum fit, and the creative alliance of students from what are, on the face of it, quite different disciplines, was really quite easy. 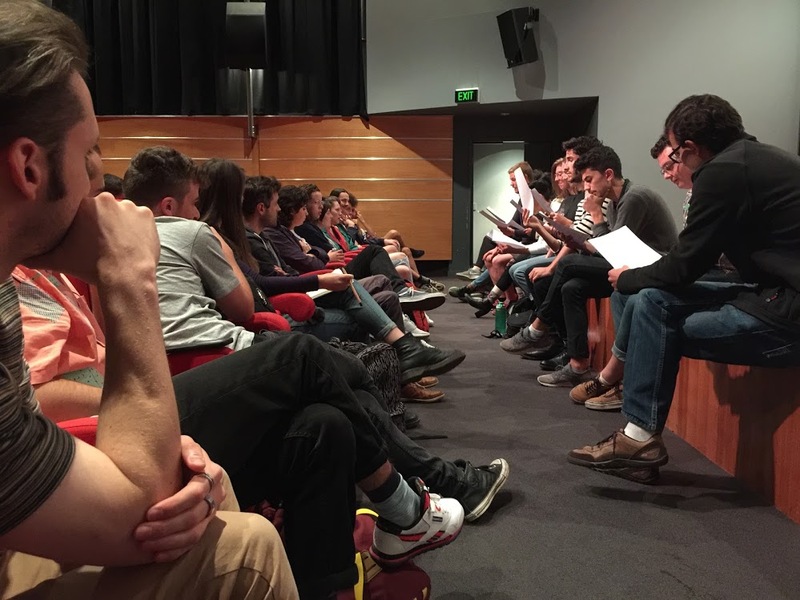 Third-year BFA (Acting) students perform the first read-through to the crew of screenwriters, directors and producers. By Andrew O’Keefe. So what’s the scope of the project? Well, throughout this year students from the Faculty of Fine Arts and Music – from disciplines including our Master of Producing, our Bachelors of Fine Arts in Screenwriting, Animation, Film and Television, Acting, our Master of Fine Arts in Documentary, and our BMus in Interactive Composition – have been tasked with conceiving of and creating three broadcast-quality web series, as well as a documentary on this, our first crack at such an ambitious project. Director Hannah Hermmann-Payne, cinematographer Andrew Kirkman and screenwriter Millie Holten rehearse a shot for The Waiting Game. By Andrew O’Keefe. WINGING IT. In this timely satire, Heaven has been corporatised. The angels work at call centres answering prayers – but it’s quantity over quality. Performance reviews, sales targets, efficiency reports. Even the legendary Archangel Michael has succumbed. Now a rookie has just got her wings and she’s going to shake things up. THE WAITING GAME. At a restaurant, set on one night, a romantic comedy about a waitress and a chef’s unrequited love is put to the test through a series of romantic dates who arrive at their restaurant. TECH INC. GLOBAL. In this absurdist comedy, Dexter’s proud parents and the rest of their dysfunctional family band together to form an app developing company named Tech Inc Global. In this heart-warming story, Dexter learns that success at the expense of your family is not success at all. Surprisingly the most difficult obstacle for me so far has turned out to be managing my own feelings of professional redundancy. One moment I’m asking the cohort, “Do you think this project might be fun?” and the next, 126 students from seven disciplines had stolen the project right out from under me. 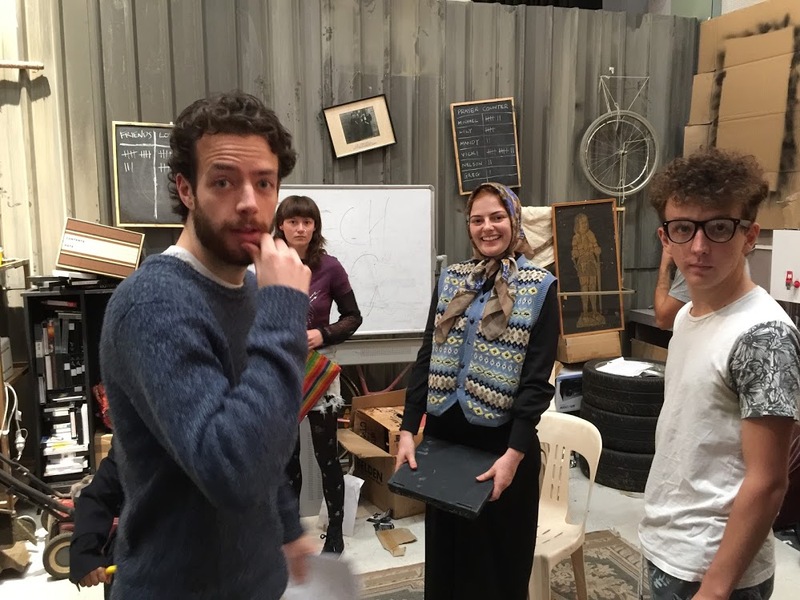 BFA (Film and Television) Director Alex Thomson with BFA (Acting) students Aquila Sorenson, Annabelle Mitchell and Noah Casey on the set of Tech Inc. Global. By Andrew O’Keefe. They don’t even look me in the eye when I pass. I like to imagine it’s their guilt, but I know it’s really about their total commitment to each other. It is not a nice feeling when students surpass your expectations. I’m not meant to say that. I should be full of pride and admiration – and I am, overwhelmingly so. But when students not only surpass but disintegrate expectations it means that I grossly underestimated their abilities in the first place. I should have known better. To illustrate this, I need to look no further than the stories themselves. I imagined the three series to be small in scope – perhaps a tale of a group of university students trying to cope with the trials and tribulations of campus life. As the elevator pitches above amply demonstrate, I was wrong. Perhaps what I underestimated was actually the students’ fear of letting each other down. 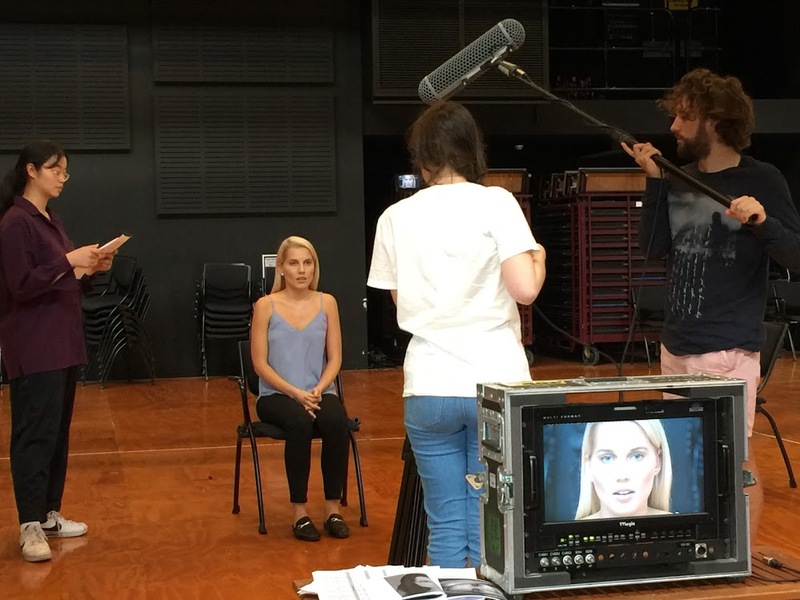 BFA (Acting) student Lauren Steiner auditions for the web series. By Andrew O’Keefe. Already, six weeks in, I’ve witnessed followers become leaders; leaders become delegators. The camaraderie between students on set is palpable. Gone are the perceived fictional boundaries, such as disciplines, degrees and timetables, that may have existed before. In the halls of the Film and Television building there are now actors, artists, prop makers, photographers, designers; students who, before this project, may never have been in that building. It’s a similar scenario for the Film and Television students: the simple act of crossing the road to the Faculty’s Performing Arts building and beyond has given them a humbling respect for other student’s craft and education. 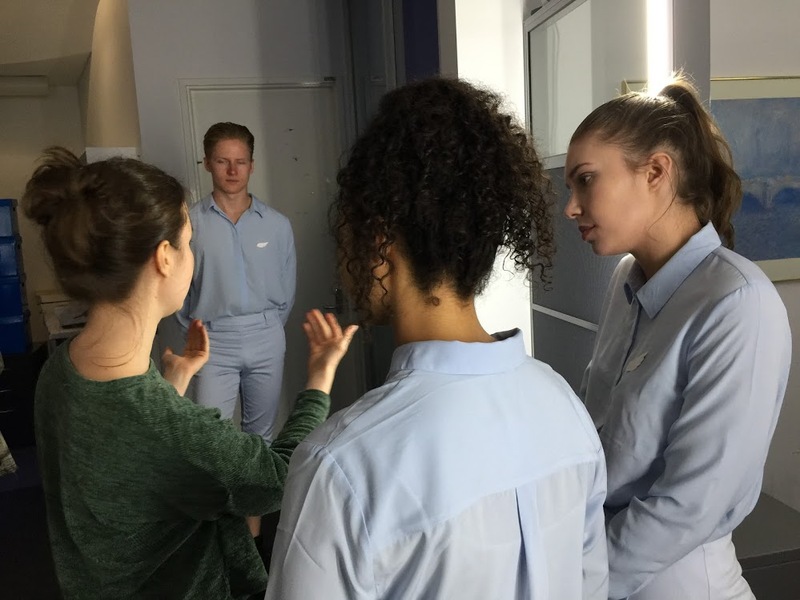 BFA (Film and television) director Sarah Burrial directs three BFA (Acting) “Angels”, Cameron Grant, Lucy Ansell and Hayley Browne on the set of Winging It. By Andrew O’Keefe. They have become collaborators who deeply rely on each other’s commitment to the story they are telling together. They all face the same fear of putting their creative selves on the line – first to each other, then to the University, and finally, when this project is completed, to the world. People keep stopping me to ask, “How’s the web series going?”. I’ve stopped trying to answer this question. Now I just shrug. I have no idea how it’s going. I’ve totally lost control of the project. It belongs to the students now and has become something far better, far more professional and engaging than I ever imagined. It turns out I really had no vision as to what this Web Series project could be. I guess I’ll just see it when it’s finished along with everyone else. Find out more about degrees at the Victorian College of the Arts and Melbourne Conservatorium of Music. Banner image: Andrew O’Keefe losing it. By Giulia McGauran. Inspiring story – can’t wait to see the series either!